240 x 150 mm. – 142 leaves, vellum. With 4 full-page and 38 small miniatures in grisaille with some accentuation in colour and highlighted in gold. 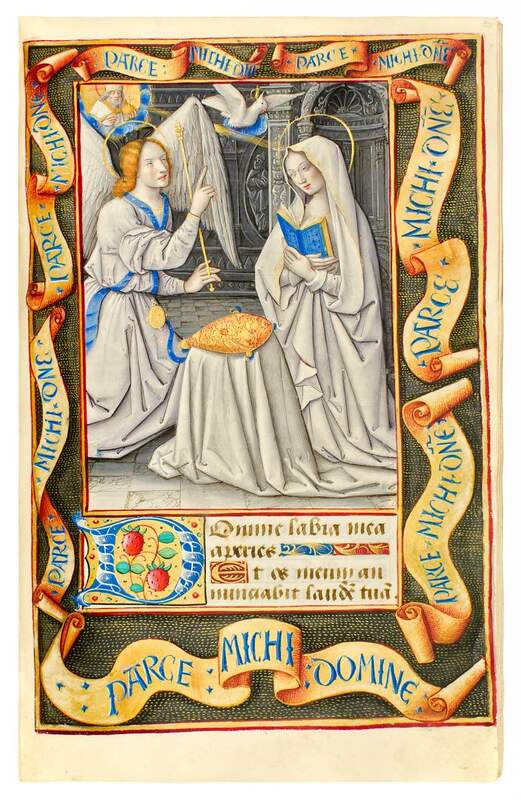 This exceptionally fine Book of Hours shows the refined quality of a great artist. The varied gradients of grey combined with a small proportion of few other pigments emanate a degree of translucency and purity. This style became a hallmark of the hand of the Master of Petrarch's Triumphs (fl. c. 1495-1510). The Master is named after his illumination in a newly translated copy of Petrarch's Trionfi commissioned in Rouen (Paris, BnF, ms. fr. 594). Stylistic features in the Triumphs manuscript suggest the artist's knowledge of the work of Jean Bourdichon and Jean Poyet, both from Tours. Even though the artist was employed for Rouen assignments, he is thought also to have worked in Tours and Paris. In this manuscript, the repeated motto Parce michi Domine (Job 7:16) - meaning 'Spare me, O Lord' - may possibly relate to a specific patron's device. While rooted in spiritual aspiration, this opulent manuscript nonetheless provided the owner with a luxury object that expressed her/his social status.